November 1893, the month before Sherlock Holmes supposedly fell to his death at the end of the adventure ‘The Final Problem’, saw the character make his debut on the stage. ‘Under the Clock’, a one-act musical satire, opened on the twenty-fifth of November at the Royal Court Theatre, London, forming part of a triple bill. The play was written by Charles Brookfield and Seymour Hicks, who would also portray Holmes and Watson respectively (albeit with a strange choice of wardrobe – Holmes wore black tights and sported a full beard, while Watson’s apparel included a monocle and a pirate’s cap). The play and its satirical tone, which was merely used as a front to throw mocking asides at certain members of the acting establishment, was given short shrift by the reviewers as well as Sir Arthur Conan Doyle himself. Despite this, the play achieved seventy-eight performances before the curtain fell for the final time on the twenty-fifth January, 1894. Seymour Hicks would enjoy a long career on the stage and the silver screen. He played a great many roles, but the one that he is best remembered for is that of Ebenezer Scrooge, the cold-hearted miser from Charles Dickens’ classic ‘A Christmas Carol’. Not only did he regularly perform the part on stage from 1901 onwards, but he played the role twice on the big screen. Firstly in the 1913 silent film ‘Scrooge’ released by the Zenith Film Company, and again in 1935, with the first full ‘talkie’ version, which was released by Twickenham Film Studios. Seymour Hicks died in 1949, aged 78. The latter stages of Charles Brookfield's career were not as sucessful as that of his Watson. 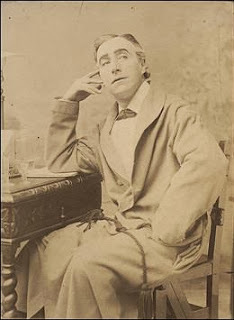 He was heavily criticised for his involvement in the libel case against Oscar Wilde in 1895. He gave up acting in 1898 after a serious illness which saw him diagnosed with an advanced form of tuberculosis. He continued writing theatrical works while he convalesced; the most noted of these was the musical comedy 'The Belle of Mayfair' in 1906. He died in 1913, aged 56.